Flight Operations Notices, Langley Flying School. 1. All runway clearances from a Tower Control Unit pertaining to lining up to wait for take-off clearance, or a takeoff clearance, must be read back. 2. All altitude restrictions assigned by a Tower Control Unit must be read back. Please be sure you are in compliance, and contact your Flight Instructor if you have and questions. Except in emergencies, or with prior permission from the Chief Flying Instructor, landings are only permitted at airports certified by Transport Canada. Our neighboring school in Hangar 5 have expressed concern about delays on the taxiway separating Hangar 5 and LFS. Whenever possible, please be sure to push back the Cherokees prior to engine start so as to permit taxiing between the two hangars. Also, aware of possible AAA aircraft waiting for us to shut down or start-up, and for this reason, safely expedite these procedures when required. See your Flight Instructor for additional information. Effective immediately, Langley tower has begun a new helicopter circuit operation inside the right-hand circuit for Runway 25 - north of the runway surface. The helicopters will operate at 600 ft. Be patient as there could be a slowdown on the rate of launches and landings. See your Flight Instructor for additonal information. The rules for aircraft maintenance are somewhat complicated and we want to be sure all students are aware of their responsibilities in this regard when conducting cross-country flights. Langley Flying School aircraft are commercial aircraft and all non-emergency maintenance tasks, including repairs when away from bas (Langley Airport) must be conducted in accordance with the school's Maintenance Control Manual (MCM). If an aircraft defect is encountered while on a cross-country flight, the MCM requires the Pilot-in-command to report the defect to a Flight Instructor. The Flight Instructor must then ensure that the defect and repair is properly documented in work order records and the Journey Log and ensure that the repair is undertaken by an approved repair shop, and ensure that a proper written maintenance release is entered in the Journey Log. Failure of the Pilot-in-command to follow this procedures---by conducting, for example, improvised repair---is a violation of the Canadian Aviation Regulations, and could be subject to prosecution by Transport Canada. For commercial pilot students, remember that the first question asked in a job interview is whether or not you have every be prosecuted for violating the CARs. Remember, then, if you have aircraft mechanical problems on a cross-country fight, you must contact the school and follow the instructions of a Flight Instructor. Aircraft braking action is critical at Langley Airport owing to our landing on such short runways. Students must specifically ensure that the disc (brake) pads on both sides of the disc are not less than 1/8 of an inch, which equals 3.2 mm. At this mark, arrangements must be main for replacement; below this mark (thickness), the aircraft is grounded. See your Instructor for additional information should you have questions. Because of the increased size of the fleet, the tying-down of aircraft has become an issue for those closing the school. To spread-out the workload, we are now requiring that each student tie-down their aircraft at the end of their flight. Accordingly, this is now mandatory, and student not tying down their aircraft may be fined. Also, when pre-fighting your aircraft, you are required to REMOVE the ropes and store them in the aircraft during your flight. We will soon have “laundry bags” in the aircraft to store the ropes together, but until then, simple place the ropes behind the rear seat. Please see your Flight Instructor if you have any additional questions. An incident recently occurred in which a student conducting a solo flight accepted a landing clearance on Runway 25 requiring the aircraft to exit at Taxiway Hotel. Since this restriction requires the landing to be conducted in approximately 800', this attempts to conform to this clearance provides an unnecessary increase in the risk of a control loss, and unnecessary tear and wear on aircraft. So as to protect the safety margins normally afforded by full-length runway use, it is therefore now prohibited for solo students to accept this clearance and they should advise ATC "unable" or "unable to comply." Contact your Flight Instructor if you have any questions or require more information. Please be advised that the windows on all Cessna aircraft must be kept closed while taxiing and in flight. Feel free to request clarification if needed. Pilots/students who have flown the 172P but not the 172N and/or 172M will require transition training in the circuit to demonstrate the difference in pitch up control and extra drag caused by the full extension of 40' flaps on the Cessna 172N and 172M models. The Cessna 172P (GHEY) has a full extension of 30' flaps. Please note that the minimum altitudes for spin practice in the Cessna 152 have changed. The minimum entry altitude is now 5000' AGL and the minimum recovery altitude is 4000' AGL. The minimum spin training altitudes for the Piper Cherokee is unchanged. Pilot and student pilots should use their mobile phones to contact Langley Tower in the event of a communications-failure event. The number is posted in the Canada Flight Supplement, but you are encouraged to store the number now as a contact on your phone in preparation for the possibility. The number is (604) 534-9443. Please note that it is for emergency use only. Pilots and and Student Pilots must remember to immediately contact the Ground Controller prior to moving on the taxiway after exiting a runway. This is especially critical when exiting Runway 25 onto Taxiway G, where the Ground Controller must issue a "hold-short Runway 19/01". Nevertheless, in all cases, the aircraft should be positioned sufficient distance from the exit point of the runway to permit a second aircraft to clear the hold-short line behind you. Please ask a Fligiht Instructor if you have any questions or concerns. Caution must be exercised when flying low level in high traffic areas. Glen Valley and Harrison Practice Areas have high concentrated traffic volumes, and many low-level hazards, such as birds, training aircraft, helicopters, and float planes, especially along the Fraser River corridor. The lower an aircraft's flight path, the less options for emergency maneuvering to avoid mid-air collisions. Extra caution and lookout-effort must be used to mitigate the added risks. To avoid damage to aircraft control surfaces that could result from the rotor downwash of landing/departing helicopters, and effective immediately, the control column of aircraft (excluding the Seneca) must be secured when the aircraft is situated at the Helicopter Pumps and the pilot seat is not occupied. Students must be aware that this is the beginning of the season of increase risk of carburetor icing. In the event of an unexpected power reduction or power loss during flight, it is critical that carburetor heat be applied immediately and left on until ice in the carburetor is melted. Remember that it is normal for the engine performance to briefly deteriorate further after carb heat is applied as melted ice is ingested in the engine. The risk is that students may mistakenly respond by selecting carb heat OFF in response to the further—yet brief—deterioration. Please take time now to review your Pilot Operating Handbook and Pilot Checklist instructions on carburetor-icing response. There is operational concern with respect to landings on Runway 01 that students may perceive Langley Tower controller requests to exit at Taxiway Echo as mandatory, and that there is a risk that student efforts to do so may compromise landing safety and result in aircraft damage from excessive braking. The operational rule that overrides all communication with the Tower controllers is that student pilots should not communicate with Tower controllers—nor attempt to execute a turn to make a runway exit—until the aircraft is brought under safe control. This rule is universal and applies to any runway at any airport. For further discussions regarding this, please contact a Flight Instructor. This is to remind all students of the need to ensure that minimum altitude requirements are made when flying over a build-up area, especially with reference to flight over communities located near the base of the coastal mountains along the North Shore and the Sunshine Coast. In these circumstances, maintaining 1000’ ASL will be insufficient altitude since these communities are located on rising terrain adjacent to the water. (i) for aeroplanes, 1,000 feet above the highest obstacle located within a horizontal distance of 2,000 feet from the aeroplane, . . .
(b) in circumstances other than those referred to in paragraph (a), at a distance less than 500 feet from any person, vessel, vehicle or structure. The length of Runway 19/01 at Langley Airport is a good measure—be sure you maintain this separation from these communities is you are required to maintain 1000’ ASL. Students are reminded that landings and takeoffs on a runway are prohibited if birds are situated on the runway surface. This requirement is published in the Langley Flying School Flight Rules and Safety Precautions, which are linked on the website’s mainpage from the Student drop-down menu. Like aircraft, birds are poor at evasive maneuvers immediately after takeoff and the risk of a birdstrike-with all the control-loss and engine performance risks they present-increases drastically. If prior to takeoff birds are observe, advise the controller that you are unable to continue because of the birds, and request to taxi down the runway in an effort to clear them. If birds are observed on final approach, overshoot and advise the controller. If the birds persist, and you unable to land after repeated low passes, request the controller to contact the airport manager or school so that assistance in clearing the runway with a ground vehicle can be arranged. If this is not possible, request the second runway provided you are comfortable with the crosswind; if the second runway is not viable, divert to Abbotsford or Pitt Meadows Airports and contact the school. Good judgement is required in all cases. We have had numerous addition errors in the Aircraft Log books regarding Total Airframe Time. We have to remember to add the Air Time from your flight to the Total Airframe Time from the previous flight to come up with a new Total Airframe Time. Prior to closing the flight, please confirm that the Pilot Log Total Airframe Time is the same as the Journey Log Book Total Airframe time. You can see an example of this on the Ready Room bulletin board. If there is a discrepancy between these times, please consult with your Instructor as to how to correct the discrepancy. This is to advise students and renters that the engine start procedures have been amended a second time to address starting problems we encountered in the Revision 14-2 (February, 2014). This new starting sequence is oulined in Piper Cherokee Pilot Checklist Revision 14-3, which has been distributed to the aircraft. For additonal information, contact your Flight Instructor. This is to advise students and renters that the engine start procedures have been amended to reflect the manufacturers recommendations for starting procedures. These amendments have been incorporated into the latest Piper Cherokee Pilot Checklist Revision 14-2, and previous Pilot Checklist revisions should be disregarded. It is believed that the previous engine start practices may have provided excessive fuel priming and increased the risk for engine fire during start. For additonal information, contact your Flight Instructor. This is to advise all students of the requirement that the quick-donning lift jackets must be worn around the waist of students and Flight Instructors during Strait of Georgia crossings. If an emergency occurs during these flights, there will little time to locate, secure, and operate life jackets, when faced with the considerable demand for emergency communication, checklist work, and glide management. Be sure you a familiar with the use and operation of the quick-donning life jackets. Also, be reminded that there must be sufficient life jackets for all passengers during Strait of Georgia crossings, and that passengers must be briefed prior to departure on their use, and the emergency cabin procedures planned in the event that ditching is necessary. It was recently discovered that there are many variations in how the airplanes are being tied down. In the interest of consistency, we will be using a “two half hitch knot” (below). It is very simple to learn and ensures that no slack in the rope can develop in windy conditions. Please see your flight instructor for a demonstration. Also, in windy conditions, please ensure that your airplane is tied down, and your control column secured, immediately after your flight even if the airplane is being used following your lesson. During a recent night training flight, the flaps on Cessna 152 GPUK failed to retract following a touch-and-go procedure. The student managed to maintain speed and produce a climb, eventually completing the circuit and landing. This is the second event in the last two years where such a failure during a touch-and-go procedure has occurred. Accordingly, so that students and pilots are properly prepared for this event, a mandatory training flight is now required, effective immediately, in which students are exposed to flight management during a flat retraction failure. This training can be provided with a single circuit, or can easily be incorporated into it dual training flight. Essentially, students will be taught how to conduct an overshoot from a touch-and-go manuever with the flaps set at 35°. As students are aware, the flaps in the Cessna 150 permit a 40° setting, and we are currently investigating the prospects of demonstration/training with this scenario in Cessna 150 FPRT. Cessna pilots are reminded that they must visually confirm that the flaps are migrating from the full flap position prior to committing to a takeoff during a touch and go maneuver. Isopropyl alcohol is extremely flammable. Persons apply pressurized de-icing fluid must wear proper eye protection. Any flight with contaminated critical surfaces is prohibited. All wing surfaces must be clear of any snow or ice. Remove as much as possible any accumulation of ice or snow from the upper surfaces of the wings and upper tail surfaces with a soft bristle brush. The checklist run-up procedures have been completed (the pre-takeoff checks should be completed en route to the hold-short line). The de-icing solution should be applied using the pressurized spray bottle which contains a 50/50 mixture of Isopropyl alcohol and hot tap water; if the temperature is colder than -4°C, the solution should contain 100% Isopropyl alcohol. Below the freezing temperature, hot water alone shall NOT be used as this will refreeze, accumulate under the wing surfaces, and could jam the control surfaces. Additionally this water will refreeze on the ground causing a potential slipping hazard. After the application, ensure that all critical surfaces are free of any ice and snow, and ensure that all moveable flight surfaces have free travel in all applicable directions. The upper wing surface must be visually scanned immediately after the application of take-off power to ensure ice-crystals have not formed; if ice-crystals are apparent, the take-off shall be rejected and the aircraft shall be returned to the ramp for another de-icing application. Students are restricted from de-icing unless they have be directed to do so by a Flight Instructor who is providing direct supervision. To be effective, the de-icing produce must be applied as close as possible to engine start-up. As well, delays in post-start cockpit duties should be minimized as much as safely possible. Two wing inspections shall be conducted before takeoff, the first occurring after the run-up prior to moving to the hold-short line, and the second occurring during the initial phase of the takeoff roll. At these times, the pilot-in command shall inspect the wing surface for crystallization that would indicate a re-freeze. In both cases, the takeoff shall be discontinued. Airports inside of the red boundary line may be used in combination, using Campbell River and Agassiz as the West and East anchor points respectively. Please note that, owing to the inherent risk associated with night flying in a mountainous area, all other night cross country flights require prior approval from the CFI and must include an instructor briefing. Please contact your Flight Instructor for additional information. An incident occurred recently when a private pilot student inadvertently flew into the Pitt Meadows Control Zone, as well as the Vancouver TCA. This student had only recently been released for solo flight in the practice area, and he clearly became disoriented with respect to position during the course of upper-air manoeuvres. While events such as this are not that frequent, the severity of possible outcomes, both with respect to Transport Canada enforcement and risk of collision, could be extreme. It is of critical importance to ensure you have adequate situational awareness with respect to visual geographic markers that help identify critical airspace boundaries. If you have any doubts or concerns, it is important to inform your instructor that you need assistance. Airspace boundaries are not difficult to learn, but you must be shown clear geographic markers that help you discern the lines that appear on your VTA chart. 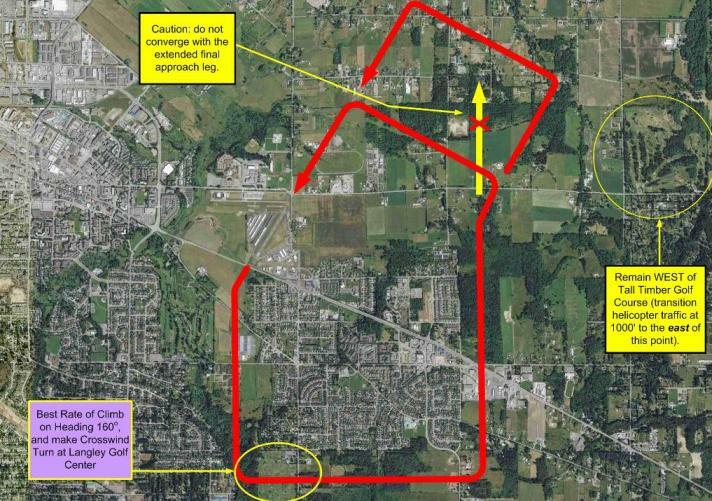 The most important boundaries are the Pitt Meadows and Langley Control Zones, as well as the Vancouver TCA boundary line establishing the base of the TCA at 2500 feet between the Pitt Meadows and Langley Control Zones. Also, be especially careful when flying upper-air manoeuvres. Flight above 4500 feet in the Glen Valley areas must be within the confined constraints of CYA 180 and 181. Within the last seven months or so, there have been three separate incidents when students conducting solo flights failed to observe that their fuel caps were not secured properly. This has raised general concerns regarding pre-flight aircraft security, and the procedures that are being followed by our students. Langley Flying School has a policy and procedure whereby a pre-boarding inspection must be conducted by both students and instructors before they board the aircraft for the purpose of engine start. Clearly, students are not complying with this procedure. Effective immediately, students failing to conduct a pre-boarding inspection as per Langley Flying School's Standard Operating Procedures are liable to fines up to $50 per incident. Repeated noncompliance by any student is an unacceptable safety risk warranting a discontinuation in pilot training. Central to a pilot licence is the discipline necessary to execute repetitive safety procedures, however seemingly mundane those procedures may appear. For more information on the pre-boarding inspection, talk with an Instructor and/or see the Flight Operations Notice #10-15 posted on the LFS website, main page. 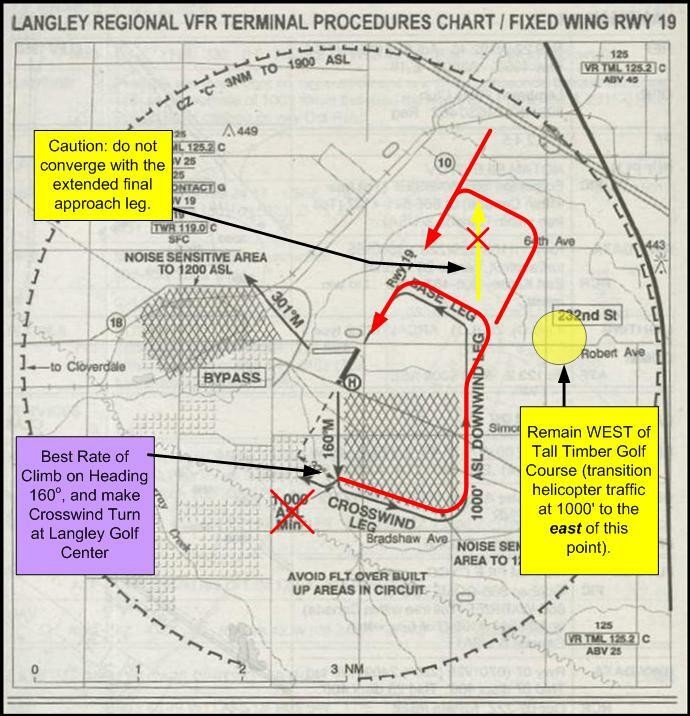 A NOTAM for Langley airport has recently been published and it includes two important changes for circuit procedures on Runway 19. 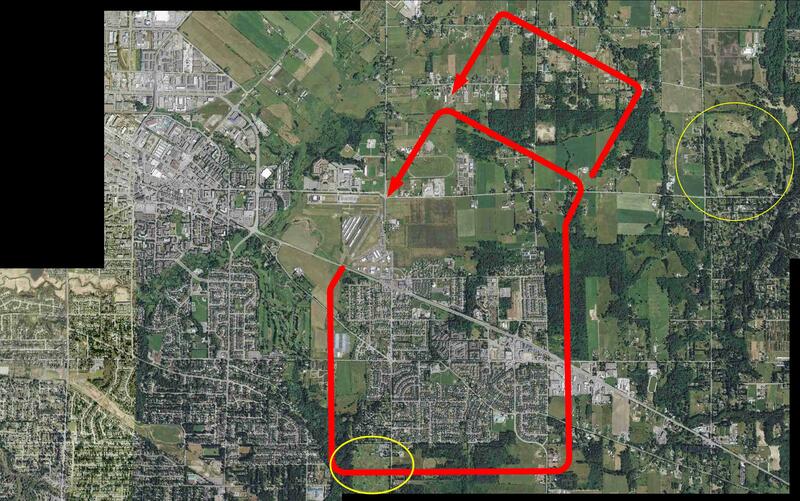 Firstly, the departure turn on to the crosswind leg will now be initiated at the Langley Golf Center. Accordingly, there is no longer a requirement to climb straight-out to 1000’ before initiating this turn, and turns four westbound departures can also be initiated at this checkpoint, provided prior permission is provided for a right turn (which is opposite to the circuit pattern). Secondly, the downwind leg for Runway 19 should be kept WEST of the Tall Timber Golf Course, which is located at the North East side of the intersection between 232nd St. and 56th Avenue. There is a risk of conflicting with inbound helicopter traffic EAST of this position as helicopters are permitted to maintain 1000 feet on the East side of the Tall Timber Golf Course position. Pilots should be reminded of a final caution pertaining to the downwind leg for Runway 19, and that pertains to the risk of converging and therefore conflicting with traffic that is approaching the runway on an extended straight-in final approach clearance. The noise abatement pattern produces an initially modified downwind leg that angles back towards the airport and a modifying turn is required to continue parallel to Runway 19. To avoid the potential conflict, downwind traffic should modify their heading abeam the runway to approximately 010° (or fly perpendicular to the TransCanada Highway). Please see the depictions below. Be sure to ask instructor if you have questions. The Langley tower controllers have expressed concern regarding the reluctance of pilots to clear the runway exit points after crossing the hold-short. Pilots are clearing the runway past the hold short line, but then stopping in that position to complete checklist work, without leaving room for traffic to clear the runway behind. This has the effect of blocking that exit for landing traffic that have subsequently landed. Pilots must complete two tasks after clearing the runway, the first is the completion of checklist work, and the second is radio communication with the ground controller. These tasks must still be done, and for student pilots, they must be done after the aircraft has been brought to a stop. The solution, however, simply requires that pilots who have just cleared the runway to taxi forward enough to leave room behind them for other aircraft to also clear. Effective immediately, the Flight Training and Safety Rules have been amended to reflect the commencement of seasonal flight training operations at Grand Forks Airport, as well as the addition of cross-country weather minimum. (below). Please note the addition of weather minima for flight along the Strait of Georgia (not just across). “Direct-to-the-threshold” clearances are sometimes used by Tower controllers to manage aircraft spacing at airports equipped with long runways. While the pattern is not specified in the Aeronautical Information Publication, the general expectation of pilots and controllers is a modified approach pattern similar to that depicted below. While these types of modified approach can be safely flown at airports equipped with long runway, giving the pilot ample time to re-stabilize the approach prior to touch down, the use of these procedures by Langley tower controllers is considered an unnecessary risk owing to the short runway surface here. Because Langley tower controllers are often students themselves, errors in instructions are not uncommon and the manoeuvre is especially risky for student pilots owing to limited experience in low-level aircraft maneuvering. Langley tower is aware of our concerns and our request for them to use alternate tools to manage traffic spacing. "GODP, proceed direct to the threshold." "Negative, unable to comply. GODP." Please contact your supervising Flight Instructor for additional information. An incident recently occurred in which a student conducting a solo flight failed to secure the fuel cap on one of the tanks. During the takeoff roll, the fuel cap fell from the wing and ended up on the runway. Subsequent investigation revealed that the student failed to conduct the Pre-boarding Check prior engine start following his refueling of the aircraft. This Flight Operations Notice is to remind all students that a Pre-boarding Check is required prior to each engine start. Importantly, the Pre-boarding Check does not replace the required Pre-flight Inspection conducted as per your aircraft's Pilot Operating Handbook; instead the Pre-boarding Check is a last minute double check walkabout the aircraft to visually check the following: fuel cap security, fuel sump valve security (no leaks), tires and brakes (normal appearance, no hydraulic leaks), engine cowling latches (secure), and a last inspection for external airframe damage. Clearly, failure to conduct the Pre-boarding Check compromises flight safety. Please see myself or your Flight Insructor should you have any questions regarding this requirement. It takes 4 seconds to clear flaps from 40° to 0°. To clear each 10° it takes 1 second. During touch and go training, after nose wheel touch down there is enough time to check the flap indicator before apply full power. An incident recently occurred in which a student conducting a solo gates flight crossed the control zone boundary without a clearance. The incident occurred when the student entered via Person-made Lakes (“Man-made Lakes”) from the south. This FON is to ensure you are aware that initial call-ups at Person-made Lakes, 232nd Intersection, or Trinity Western University are too late-----you are already inside the control zone and are in violation of Class C airspace procedures. If you have been unsuccessful in obtaining an inbound clearance as you approach the control zone boundary, you must turn away so as to ensure you do not violate the clearance requirement for Class C.
In an effort to reduce the number of aviation incidents across the industry, Transport Canada has begun to implement Safety Management Systems (SMS). Since Langley Flying School is a CARs 406 operation, implementation of the SMS program is required by September 2008. Essentially, SMS is the formalization of continually increasing safety through hazard identification and risk management. As Langley Flying School management and staff embark on creating safer flight training environment, it is important to remember that the key to the success of SMS is that the responsibility for safety involves everyone! The reporting process is not a search to assign blame in an incident, but rather, it is a search for the reasons and cause behind the incident. By working to understand how an incident occurred, it allows for a learning environment and ultimately a safe environment both for reporting and communication, as well as for flying. Consequently, to ensure safety is paramount in all flight operations, no disciplinary actions will be taken unless it is a case of willful negligence, criminal intent or includes the use of illicit substances. If you wish to be anonymous or have your identity completely confidential, with only to the Safety Management Officer (SMO) knowing the source, you can accomplish this and still contribute to the safety culture by using the appropriate forms. Email is also an excellent way to communicate with the SMO (smo@langleyflyingschool.com). As part of this safety culture, we need to reemphasize the importance of reading and signing Flight Operations Notices (such as this one) prior to flight. It is an essential tool in communicating safety issues between staff and pilots. Please ensure you have signed all FONs prior to your next flight! Thank you for your contribution to increasing safety!